Pedal Osteitis is deterioration of the pedal bone (or coffin bone). Interestingly, I have found the condition is most prevalent in geldings; it seems that after they are gelded their system generates more calcium in the bones of the lower leg, in particular the pedal bone or P3. Lack of frog pressure resulting in reduced blood circulation allows the porous P3 to become calcified, restricting the nerves and causing the horse to become concussion sensitive, particularly when nailing. I have noticed that geldings with Pedal Osteitis gain an erection during the nailing process of shoeing. When the hammering stops the erection disappears. This is a good guide to early detection of Pedal Osteitis. Of special interest are the horses which show intermittent lameness, have good healthy hoof walls, show no reaction to hoof testers, work OK on soft ground but appear to jar up on solid surfaces, are unsound at the trot but canter and gallop freely. These horses fit into a category of ‘Predictable Hoof Related Lameness’ – the age does not seem consistent as I have noted the condition in horses from two year olds upwards. They are identified as having quite upright pasterns or over long sloping pasterns, either of which can be considered to be slightly outside normal conformation and because of this, will cause the hoof to react in predictable ways. In the normal correct leg, it is easy to maintain a balanced symmetrical hoof with a sole concavity, strong walls and frog contact with the ground; these hooves have good blood circulation and good weight bearing factors, so the horse remains sound whether shod or unshod. By comparison the legs with a short upright pastern will consistently grow high heels which deprive the frog of the important ground contact and blood circulation in the hoof; the high heels will usually cause either a shortening of the toe or a flared toe (as in the club foot). Eventually the pedal bone will begin to deteriorate – this is Pedal Osteitis. It happens for two main reasons – no frog contact resulting in poor blood circulation, and also excessive concussion caused from the high heels which force the hoof to lift higher and drop shorter (very rough trot). To guard against the early onset of Pedal Osteitis these hooves need to be lowered in the heels to six millimetres above the critical junction of the widest part of the frog to maintain correct frog function and circulation in the hoof, at around four weekly intervals depending on the growth rate. The opposite conformation is the hoof with over long sloping pasterns – these hooves will always grow quickly at the toes and the heels run forwards and under. 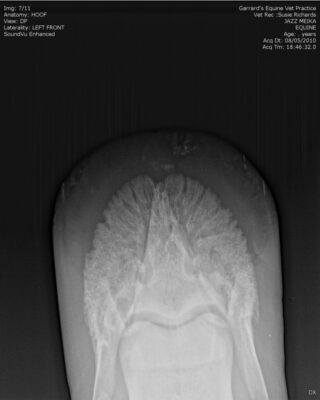 The long toes will flare causing the laminae to stretch (laminitis). This in turn puts stress on the front section of the pedal bone, resulting in inflammation and deterioration and fragmentation of the pedal bone, which again is Pedal Osteitis. This is once again a high maintenance hoof which needs to be corrected at the toes (perhaps every four weeks maximum). A side benefit of controlling the toes is that the low heel will begin to form a normal angle which helps to control the angle of the pedal bone and slow down the rapid toe distortion and stress pressure in the front part of the hoof. Many horse owners become confused when searching for the answers on treating Pedal Osteitis, as there are many opinions and options readily available, mostly regarding suitable types of shoes such as rolled toes, egg bars, heart bars, cushioned shoes and therapeutic underpads; if they offer some relief then that is great, but don’t lose sight of the primary cause of the problem which is long toes/low heel or high heels/short toes which stress the front of the hoof or deprive frog contact respectively. A plan of action which has worked for a lot of critical cases is to first trim the hoof correctly to establish frog contact, then to eliminate all flaring at the toe, taking care to maintain a concave sole. Then fit a low profile shoe short at the toe for easy break over, and feed a high calcium supplement for three months. Follow up x-rays have shown that the pedal bone has in many cases returned to normal and the lameness is gone. It is also important to stick to a regular hoof maintenance schedule with these types of conformation related hoof distortions, to avoid the cause before it starts to have any effect again. Apple cider vinegar is also a good and reliable supplement to keep the horse’s lower leg joints and pedal bones healthy. So many horse owners feel exasperated after having spent huge amounts of money following a diagnosis of Pedal Osteitis along with complicated shoeing procedures only to find that the horse is still not sound, because the primary cause of the problem has simply not been corrected.